the middle of the night at 3 a.m. You wake up by the sound of this little nasty mosquito. You switch on the light but cannot see it. After turning it off, the mosquito is there again. Surrounding you. Hungry for your blood. The rest of the night you’re constantly awake knowing you will get bitten a lot. Does this sound familiar to you? Are you always wondering why you are being attacked by the little pests while your friends, family or whoever is next to you is pared? I have exactly the same problem. Mosquitoes seem to love my blood. I am always the one who is bitten from top to bottom. 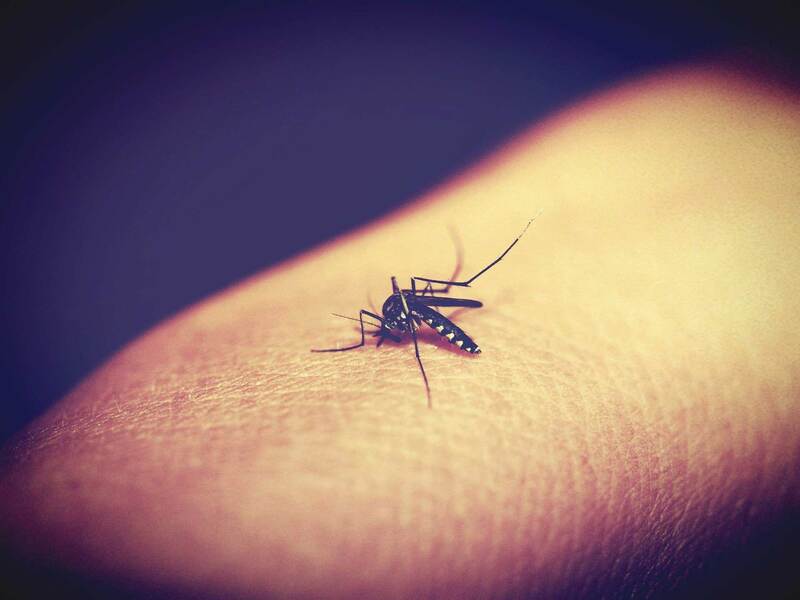 Unfortunately, mosquito bits are not just annoying, they also can lead to illness such as malaria or dengue fever. Thus, before I went to Thailand, I started to wonder if a mosquito net would be useful or not. During my research, I found that opinions differ greatly. Some say, a mosquito net is an unnecessary ballast, others recommend one to have. What’s best so? I decided to take one. Whether it was useful or not I’ll let you know in this article. Clearly ahead: The mosquito net was one of the most important gadgets we had in Thailand. But why? And which kind of net did I have? Keep reading and you will know. I just don’t like it to spend my time in tourist hotspots. I prefer to experience a country as authentically as possible. However, motivated by the two mentioned reasons we stayed in some lodgings that were more than basic. Actually, some of them were just really nasty. The mattresses were badly stained, the walls or the floor of the room had large cracks through which some creepy-crawlies could come in, and the windows and doors were anything but dense. So, at first glance, not the most optimal conditions to spend a calm night. I really don’t mind basic conditions but these were sometimes out of limit. At least at this point since it was my first big backpacking trip. I can remember several lodgings where we were visited by lizards or other animals in our hut. 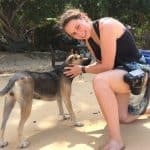 Especially our tree bungalow in the Khao Sok National Park, our hut on Koh Phayam and the accommodation in Umphang have been very memorable for me (even though I highly recommend them on Koh Phayam and Khao Sok National Park). Without a mosquito net, I would not have wanted to sleep in any of these accommodations. I would have spend for sure a restless night there, constantly thinking of an animal crawling around on me, even if it was just imagination. Nevertheless, the locals seemed to feel that way or had at least prepared for the sensitive tourists – 2 of the 3 mentioned bungalows actually had a mosquito net. Anyhow, even these ones I didn’t want to use. You just needed to have a look at them and wanted to run away screaming. They were so filthy that my fingers literally started tickling when I needed to touch them. Thus I just touched them, if at all, with my fingertips to move them out of the way. Instead, we always hung up our own mosquito net. It was shaped like a pyramid and even had a bottom part. Thus no need of stacking it under the mattress. The best part, because of the button part we didn’t need to have any contact with the mattress. Honestly, it sometimes saved our lives and I was able to sleep soundly and deeply every night. What makes the mosquito net so recommendable? Our mosquito net was shaped like a pyramid that has a bottom. You can open it via a zipper along one side to crawl in. The net offers plenty of space to lie down, without running the risk to touch the net itself. When you put objects inside the net on the edges, the shape can be adjusted even better. Probably the most important factor of the net is the bottom part. It’s completely closed so nothing can come in. It was basically similar to sleeping in a tent. We just needed to close the zipper of the entrance and were safe from any small animal. Contrary to mosquito needs that need to get stuck under the mattress we also didn’t need to be afraid of bed bugs. Because of the bottom part of our net, we didn’t even touch the mattresses. So a perfect gadget for calm nights. Another clear plus for this particularly mosquito net is the low price. The price/performance ratio is unbeatable. We used it almost every single day within the 5 weeks of travelling and couldn’t find any damage on it. So it’s clear: I can really recommend buying this mosquito net!! Does everybody need a mosquito net? 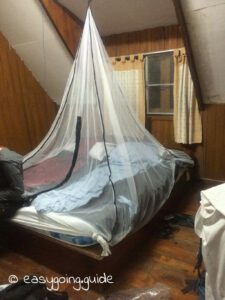 Although the mosquito net was one of the most important travel gadgets for me, it is by no means the case that you have to have a net with you. It all depends on where you are travelling to. Additionally, the budget is a really important factor. We also stayed at places like Bangkok or Mae Sariang, which were a bit more expensive (30-50 € for a double room per night). There we did not need a mosquito net at all. Thus, it really depends on what your trip should look like. If you prefer to stay in the cheapest accommodation, I strongly recommend having a mosquito net with you. Not only that you are protected from all sorts of animals, but it also does not matter what the mattress looks like. Because of the tent-like structure of the mosquito net, you don’t touch the mattress anyway. Personally, I was able to sleep calmer and completely free of disgust. However, if you are planning on staying in more expensive and upscale accommodation, you can save yourself the added weight of the network, unless you want to play it safe and, if necessary, be more flexible with the price categories. For me personally, the mosquito net was one of the most important utensils. It was in constant use except for a handful of nights. I can recommend using an inlet inside the mosquito net. It let your sleep be even more relaxed. Do you prefer having a mosquito net with you? Or do you prefer not to carry the extra weight?